Cisco is extending its core routing product line with a new model boasting 400 Gbps per slot capacity and the ability to scale to multi-chassis configuration with nearly 1 petabit per second capacity. The platform is engineered for high densities of 10 GE, 40 GE and 100 GE in core service provider networks. The scalability enables up to 64x100 GE ports in one chassis. The platform is powered by a new set of custom ASICs developed in-house. 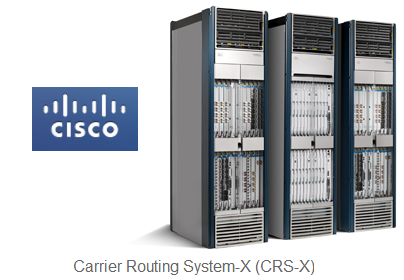 The Cisco Carrier Routing System-X (CRS-X), which will ship later this year, retains IOS-XR and line-card compatibility with the previous CRS models while offering 10 times the capacity of the original CRS-1, which was introduced in 2004. Key innovations include Cisco AnyPort technology allowing the use of new CMOS-based line card (Cisco CPAK) to reduce power consumption, reduce the cost of sparing, and increase deployment flexibility. For example, each interface can be configured for either single port 100 Gigabit Ethernet, 2x40 GE, or 10 x10 GE and either short-, long-, or extended-reach optics by selecting a specific CPAK transceiver. The CRS-X architecture also allows for IP and optical layer convergence. The CRS-X can be configured with integrated optics or the new Cisco nV optical satellite. Both allow for a single IP and optical system that utilizes Cisco’s nLight technology for control plane automation. The nV optical satellite deployments operate as a single managed system with the Cisco CRS Family to reduce operational expense and deliver high-density 100 GE scaling. Cisco noted that it has shipped more than 10,000 CRS systems since 2004. "Cisco’s flagship networking platforms are designed with investment protection for decades and beyond, unlike other technology providers, which force operators to rip and replace their products on a regular basis. Service providers, large educational and research networks, and government agencies around the world are preparing for the next-generation Internet and the increasing demand for video, collaboration and distributed computing. Cisco CPAK technology and 400 Gbps per slot CRS-X demonstrate Cisco’s commitment to leading the industry in IP core technology and protecting the investment of our existing CRS customers," stated Surya Panditi, senior vice president and general manager, Cisco’s service provider networking group. In March 2103, isco showcased its new 100 Gbps, CMOS-based transceiver technology at this week's OFC/NFOEC 2013 event in Anaheim, California. The new technology, which Cisco describes a breakthrough for the rollout of 100G services, is powered by Cisco’s nLight silicon. By integrating advanced optics in complementary metal oxide semiconductor (CMOS) technology, Cisco is able to significantly increase face-plate density for 100G pluggable optics. 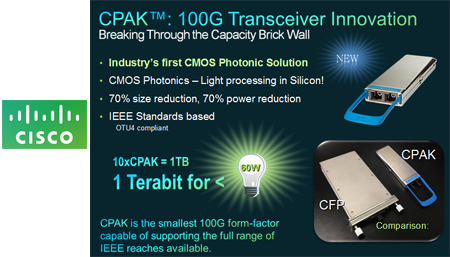 The Cisco "CPAK" transceiver, which will initially be available on the Cisco ONS 15454 MSTP 100 G coherent transponder, reduces space and power requirements by over 70 percent compared with alternative transceiver form factors, such as CFP. Future routing and switching line cards will also incorporate CPAK technology. Cisco’s first line card to incorporate CPAK technology is the 100Gbps CPAK Coherent DWDM line card, compatible with the ONS 15454 MSTP platform. The card uses Cisco’s 100GE IEEE standards-based LR4, SR10 and ER4 CPAK pluggables on the client interface and Cisco’ ultra long-haul coherent technology on the network facing (trunk) interface. In addition, Cisco announced that its 100G DWDM powered by nLight technology can cover distances of up to 4,800 km without the need for signal regeneration. The density of the technology enables 6 x 100G Transponders in a 6 RU chassis, or the equivalent of 8.4 Terabits of I/O in a single rack. Broadcom unveiled its highest performance, multicore processor to date -- the XLP900 Series, packing 80NX CPUs on a single die for 160 Gbps performance. The new XLP900 Series is optimized for deployment of network functions such as hardware acceleration, virtualization and deep packet inspection. Broadcom's XLP900 Series, which is implemented in 28nm, extends the company's portfolio of multicore processors for networking applications. The new flagship processor features end-to-end virtualization, advanced security capabilities such as deep-packet inspection (DPI), and innovative network and application intelligence technology with wire-speed networking and multi-layer QoS capabilities. Broadcom said up to eight of its XLP900 processor can be linked to function as a single device with 640 NX CPUs for the full 1.28 Tbps system performance. Sampling is underway. 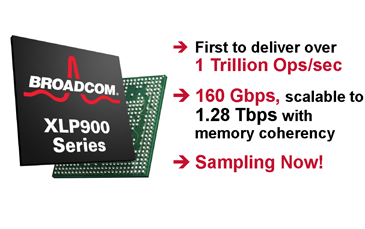 "Our new XLP900 Series of processors integrates server-class CPU core performance with industry-leading networking and communications technology to deliver the industry's highest performance, most scalable and intelligent processor for next-generation networks," said Ron Jankov, Broadcom Senior Vice President and General Manager, Processor and Wireless Infrastructure. "By out-executing the industry and being first to market with a multicore solution capable of over a trillion operations per second, we once again raise the bar and further solidify our technical leadership." 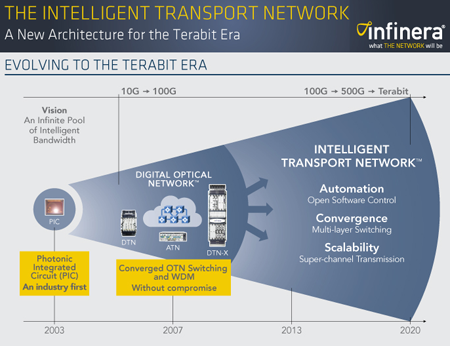 Infinera outlined its architecture for an Intelligent Transport Network for the Terabit Era. The company will leverage its photonic integrated circuits, converged OTN switching + WDM transport, 500G super-channels, and next-gen Transport Software Defined Network (SDN) capabilities to enable dynamic carrier infrastructure for cloud-based services and data center connectivity. 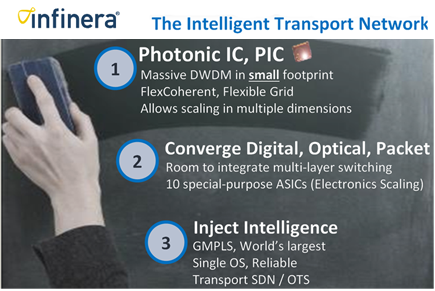 Infinera said its Intelligent Transport Network represents an evolution of its Digital Optical Network, which it introduced in 2005, by adding advanced automation and multi-layer resource orchestration controls. Scalability: 500 Gbps FlexCoherent super-channels today and designed to scale to terabit super-channels and Terabit Ethernet in the future. Convergence: By converging packet, OTN and reconfigurable optical add-drop multiplexer (ROADM) switching functions the Intelligent Transport Network is designed to reduce complexity while lowering overall network spending without compromising performance. Automation: The Intelligent Transport Network features intelligent software control to help simplify multi-layer provisioning, and in the future will support Transport Software Defined Network (SDN). Automation allows end-user control of their own network services and aligns service revenue to transport network growth through capabilities such as Infinera Instant Bandwidth™. "We believe Infinera delivers the world's most innovative networking solutions, helping our customers win in the marketplace by enabling an infinite pool of intelligent bandwidth," said Dave Welch, Infinera EVP and Chief Strategy Officer. "The Intelligent Transport Network takes the Digital Optical Network to the next level with automated control, converged multi-layer switching and scalable super-channel transmission. Unlike the competition, we are not retrofitting legacy 10G and 40G platforms. We have designed the Intelligent Transport Network from the ground up for the Terabit Era." TeliaSonera International Carrier, which has previously deployed Infinera's DTN-X platform across its North American network, is now extending the rollout of Infinera equipment in its European network. The first route is Stockholm-to-Hamburg, one of the busiest on its European network. TSIC, which operates a wholly owned fiber optic network connecting 200 Point of Presence (PoPs)) across Europe, North America and Asia, said it chose Infinera in part for the speed in configuring bandwidth for new customers, some of whom are asking for large bandwidth configurations to ready in a matter of days. The Infinera platform has helped TSIC win new customers by its rapid provisioning. "Stockholm to Hamburg is an important network route for us both for delivering services to our Nordic and Baltic end-users and for being part of the global long haul routes Europe-Russia and Europe-overland to Asia," said Erik Hallberg, President of TSIC. "Our experience in North America is that Infinera gives us a competitive edge by enabling us to use time as a weapon to deliver 10 GbE and 100 GbE services faster than the competition. We look forward to expanding our Intelligent Transport Network into Europe with Infinera. In November 2011, TeliaSonera International Carrier and Infinera performed the world's first terabit trial in California based on DTN-X equipment. In August 2012, TeliaSonera International Carrier (TSIC) and Hibernia formed a strategic partnership for global media distribution. Under the deal, Hibernia Media will acquire TSIC's MediaConnect business, while TSIC's fiber backbone will form the core of the new network. 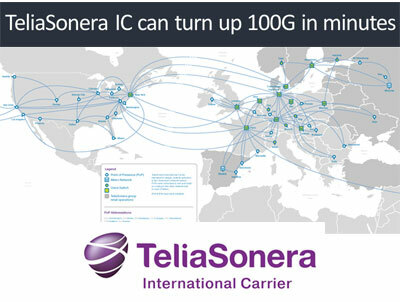 In July 2012, TeliaSonera International Carrier comfirmed deployment of a new 100G DWDM overlay network across Europe based on Nokia Siemens Networks' hiT7300 platform. 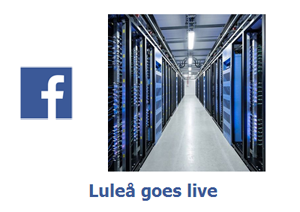 Facebook activated its newest data center - Luleå, Sweden, on the Gulf of Bothnia near the Arctic Circle. Facebook said the new facility, which is powered by locally-generated hydro power, is averaging a PUE of 1.07 in early tests. The entire data center is based on Open Compute Project designs. Excess heat is used to heat staff offices. 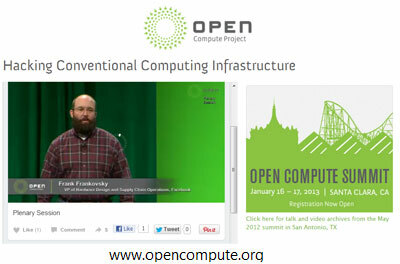 The Open Compute Project (OCP), which was launched by Facebook in April 2011, has moved from early design work to seeing the first commercial products based on its specifications hit the open market. Facebook's original idea was to share its specifications for "vanity-free" servers using barebones AMD and Intel motherboards and optimized for low-power in highly dense data centers. The Open Compute Project has evolved to challenge the industry to rethink all aspects of data center design, from motherboards, to storage, I/O, power, cooling and rack design. A big focus is on "breaking the monolith" by developing a next generation "disaggregated rack", where compute, network and storage are separate modules that can be scaled and upgraded independently of other server elements. Orange and NTT are the latest carriers to join the Open Compute Project. During the first 9 months of 2012, Facebook spent $1.0 billion for servers, networking equipment, storage infrastructure and the construction of data centers. Facebook is accelerating its data center operations to handle the data deluge from a billion users, its growing number of services, the widespread adoption of smartphones, and the fact that 82% of users are outside the United States while most of its data centers are domestic. In 2012, TeliaSonera International Carrier was selected to build and operate a new pan-European managed optical network for Facebook. The multi-terabit optical network will provide Facebook with connectivity between Internet exchange points in multiple European cities and their newest data center on the edge of the Arctic Circle in Luleå, Sweden. On the first day of public trading, shares of Gigamon (NYSE: GIMO) rose 50% to close at $28.47. The company offered 6,750,000 shares of its common stock at a price to the public of $19.00 per share. 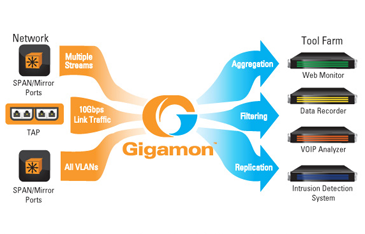 Gigamon provides intelligent Traffic Visibility Networking solutions for enterprises, data centers and service providers. The company is based in Milpitas, California. In April, Gigamon outlined its vision for software-defined monitoring based on a four-layer architecture: a Services Layer, a Management Layer, an Orchestration Layer and an Applications Layer. 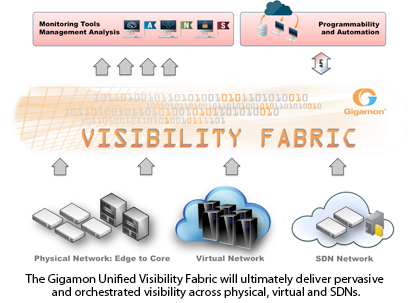 Gigamon said its strategy is to develop a unified Visibility Fabric architecture that would ultimately deliver orchestrated visibility across physical, virtual and software-defined networks (SDN). This will build on Gigamon's existing architecture and the principles of SDN to provide a centralized, programmable approach that aims to bridge the gap between the raw data passing through the network and optimally presenting that data to the tools that monitor, manage, secure and ensure application and network performance. The Services Layer currently provides advanced Flow Mapping® and intelligent packet optimization and normalization using GigaSMART technology across physical and virtual worlds and, and Gigamon expects to expand this layer to include software defined data networks with the GigaVUE-CV application which is currently being developed as a proof of concept. The Management Layer consists of the GigaVUE-FM (Fabric Manager) which provides centralized management and a common policy framework for multi-department and multi-tenant traffic monitoring and manipulation policies across the Visibility Fabric architecture. The Orchestration Layer will be developed by Gigamon to provide an open environment through a set of forthcoming APIs and SDKs to enable third party development of applications. The Applications Layer will consist of a set of visibility applications to be developed by Gigamon, as well as through independent software vendors to deliver optimal tool utilization and performance. 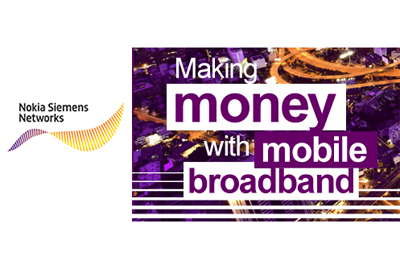 Nokia Siemens Networks outlined its Technology Vision 2020 blueprint for future mobile networks to help operators deal with extreme traffic growth, simplify network operations and provide the ultimate personal gigabyte experience. “Until now, end users have learned how to use mobile broadband networks to enrich their lives. In the future, end users will teach networks and devices how to evolve and adapt to 2020 lifestyles. Technology Vision 2020 is a guide that equips mobile broadband networks to adapt to those lifestyles. We are working closely with customers, partners, top universities and research institutes to make Technology Vision 2020 a reality,” says Hossein Moiin, executive vice president, Technology and Innovation, and member of the Executive Board, Nokia Siemens Networks. 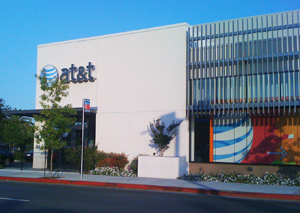 AT&T is seeking applicants for more than 1,800 jobs that are now open throughout Texas. The positions include technicians to help with U-verse installation, customer service representatives for the company's call centers and hundreds of openings at retail stores. AT&T currently employs more than 35,000 Texans. From 2010 through 2012, the company invested more than $7.0 billion in its Texas wireless and wireline networks. In addition, the company is busy with its recently launched Project Velocity IP (VIP), a three-year investment plan to expand and enhance its wireless and wireline IP broadband networks.